As though waking up in the morning isn’t hard enough, one Aussie woman woke to find a five meter (16.4ft) snake straddling her bedroom wall. Trina Hibberd was visiting a friend’s house in Mission Beach, northern Queensland, on Sunday when she woke at 4:30am to find a 40kg (88lb), five-meter Scrub Python stretching from the lounge into her bedroom. The snake, which they named Monty, can be seen stretched out along the wall from one room into another having draped itself over a hat stand and a picture frame, flicking on a light switch and knocking over a lamp en route to the bedroom. To make matters worse, it’s understood the snake was probably living in the house for the last decade, according to the ABC. As would be expected, “all hell broke loose,” Hibberd said of the unwanted visitor’s discovery in the house. This snake was IN HER BEDROOM. DRAPED ACROSS HER FOOTBOARD at 4:30 in the AM. You wanna talk heart attack on sight. Once captured, Monty was then released into a local water treatment plant where it was hoped it would make its way into the native bushland to the rear. 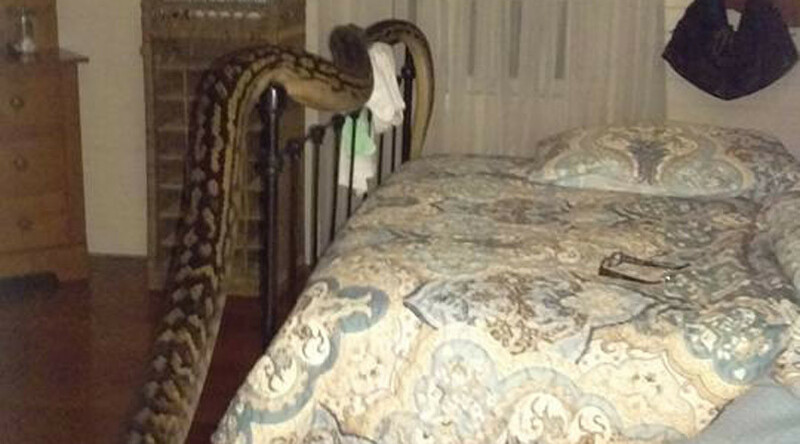 Am I the only one who thinks that giant carpet snake went into that woman's bedroom in NQ for a midnight snack?